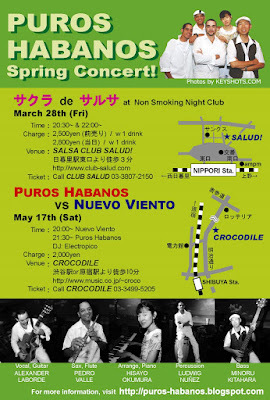 3/28 Puros Habanos Spring Concert "Sakura de Salsa"! Please come join Puros Habanos to celebrate Sakura season! For ticket and details, please see at http://puros-habanos.blogspot.com/ . 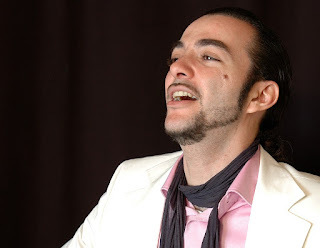 Alexander Laborde Padron is a leading Latin singer and guitarist based in Tokyo, Japan. His musical styles vary from salsa to ballads and beyond, blending unique guitar stylings with a sweet, strong voice that captures the hearts of seasoned Latin-music fans and first-time listeners alike. Born in Cuba, Alexander studied under Director Lineres of the Cuba National Opera and went on to sing in the National Polyphonic Chorus directed by Professor Carmen Collado of the Cuban National Art University. He has been performing professionally from the age of 21, and his prolific career has taken him throughout Europe and Asia where his popularity continues to grow. Alexander has been active in Japan since the summer of 2004. Since that time he has gained a devoted following both in and outside of Tokyo. In 2005, he was invited to perform at the Aichi Expo with the legendary Pancho Amat, and he continues to collaborate with a wide range of Latin-music stars when they visit Japan. Recently Alexander has expanded his activities beyond live performance into the realm of professional recordings for private companies. 2007 marked several milestones for Alexander. He wrote the theme song for the famous Japanese racehorse Deep Impact which enjoyed enormous success, and he was featured in Gendai Guitar, a noted classical guitar magazine distributed all over Japan. Last year also saw Alexander’s debut at Roppongi Hills, Tokyo Midtown, and at multiple summer music festivals. In the Fall he traveled to Ashiya and Kobe where his solo live concerts earned him hundreds of new Latin music fans on the west side of Japan. 2008 promises to be another monumental year as Alexander rides the wave of his recent success. Look for him in Aoyama, Akasaka, Roppongi, and Yokohama where he performs regularly in the Kanto region’s most happening live houses and bars. Nippon Kodo, Japan Cigar Club, Soft Bank, Tazaki Jewelry, 31 Country Club, Hiroo Rotary Club, and others. Alexander is available for private parties, solo and collaborative concerts, and commercial recordings. Rates vary according to each project. Please contact us for details.